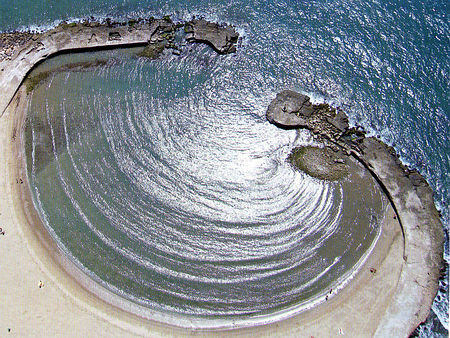 Friction with the sea bed as waves approach the shore causes the wave front to become distorted or refracted as velocity is reduced. The image below shows how the refracted wave becomes increasingly parallel to the shoreline. Waves in the middle of the bay, where the water is deeper, do not lose velocity as rapidly. Since the paths of the waves in the bay are diverging or spreading out, wave energy is much reduced, allowing deposition to occur. The coastal defence rock islet in the diagram below absorbs wave energy but interferes with the pattern of waves. The waves refract round the islet, with wave fronts crossing each other in the lee of the island. This would leave some parts of the beach behind the islet with waves approaching parallel to the shore and others with waves approaching at an angle. 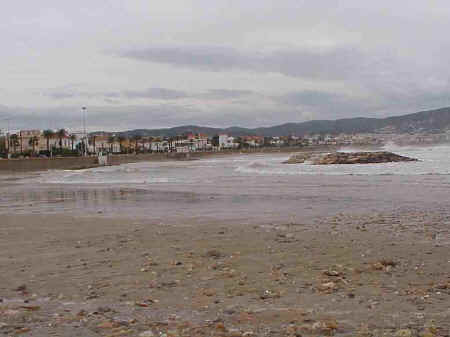 Waves breaking at an angle on some areas of the the beach would thus lead to the removal of sediment by longshore drift.